If you’ve got a pork lover on your list, there’s no better cookbook than A Girl and Her Pig: Recipes and Stories by April Bloomfield. Bloomfield is known for her New York restaurants The Spotted Pig, The Breslin, and The John Dory, where she cooks dishes influenced by her English roots, many of which are included in this book. 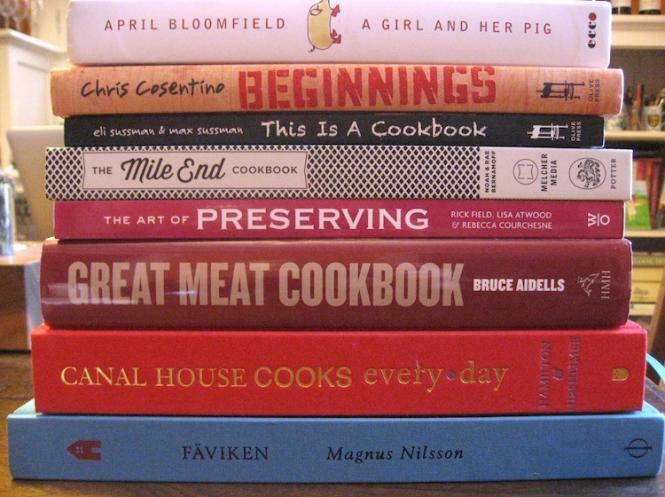 And not all the recipes are pork-obsessed, by a long shot. In addition to porky dishes like Cassoulet and Whole Suckling Pig, you’ll also find recipes for Stewed Octopus with Butter Beans, Duck-Fat Potatoes, and Bloomfield’s trademark Ricotta Gnudi (a very easy, pillow-like homemade dumpling). You might recognize Chris Cosentino from his recent win on Top Chef Masters; he’s also known for his cooking at his San Francisco restaurant Incanto and his meat-curing at his Bay Area company Boccalone. In his first cookbook, Beginnings: My Way to Start a Meal, Cosentino focuses on the oft-overlooked hors d’oeuvres/appetizer portion of a get-together, with recipes like Charred Fava Beans, Mint & Aioli and Grilled Peaches, Gorgonzola & Dandelion Greens that will make cheese-and-cracker plates a thing of the past. This is a Cookbook: Recipes for Real Life by Max and Eli Sussman is a lively read that makes cooking seem fun and easy without dumbing it down. Recipes range from dishes perfect for late-night (Thin-Cut Fries for One, Fried Rice, Kitchen Sink Pasta) to more sophisticated fare for a dinner party or date (Grilled Figs with Burnt Honey and Pistachio Yogurt; Fresh Garganelli with Tomato, Porcini, Guanciale, and Pecorino). Not just a book for the culinarily-minded college student, the recipes will appeal to anyone looking to invigorate their cooking without spending hours at the stove. If you – or, lucky you, someone you know – is a canning fanatic, you can never really have too many canning cookbooks. But in The Art of Preserving, by Rick Field, Lisa Atwood, and Rebecca Courchesne, offers something new – not only recipes for preserving, but recipes for what to do with the finished preserves. Preserved Lemons become Roast Chicken with Preserved Lemons & Herbs, and Quince Preserves become Flatbread with Quince Preserves & Gorgonzola. Recipes run the gamut from sweet to savory, including jams, jellies, curds, salsas, pickles, and more. It’s getting more and more complicated to be a meat-eater these days, but it just got a little bit easier, thanks to The Great Meat Cookbook by Bruce Aidells. This ultimate reference guide to both buying and cooking meat explains not only the traditional basics like cuts of meat, but also current terms like grass-fed, organic, natural, pastured, and heirloom breed. Recipes like Pork Stew with Hard Cider, Baby Onions, and Potatoes and Roast Bison Sirloin are tagged by categories like Cheap Eats, Family Meal, In a Hurry, Freezes Well, and more for easy selection. Canal House Cooks Every Day, by Christopher Hirsheimer and Melissa Hamilton, is a compendium of simple recipes and beautiful photos, organized by month (and day and weather), into a kind of diary of cooking and eating. Dishes like Spinach Tagliatelle with Tomato Sauce and Ricotta and Chicken Thighs with Pancetta and Caperberries have few ingredients and few steps but turn out delectably potent results. If you can’t make it in person to Fäviken, Magnus Nilsson’s landmark restaurant in Sweden, then this breathtakingly gorgeous book is the next best thing. The book – also named Fäviken – may not include the most approachable recipes (Black Grouse in Hay, anyone? ), but cooking from it isn’t exactly the point. This book is all about inspiration, and seeing what is possible when we really rethink food. Cookbook as escapism/vacation/artistic inspiration/intellectual challenge? This one has it all. Noah and Rae Bernamoff have become deservedly famous for their Brooklyn restaurant Mile End (and its incredible Smoked Meat Sandwich). Now they share many of their recipes in The Mile End Cookbook, a collection featuring a wide variety of updated Jewish comfort food, from Smoked Whitefish Salad to Celery Root-Parsnip Latkes. There’s even a recipe for that famed Smoked Meat, to bring a taste of Brooklyn to your own kitchen. Claire Stanford is a writer and editor at Simple, Good, and Tasty. She last wrote an event recap for Farm in the Cities. She can be reached at claire@simplegoodandtasty.com. Follow her at @clairemiye.